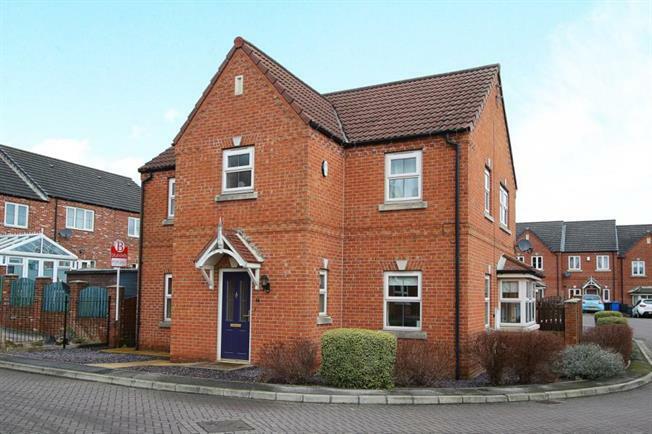 4 Bedroom Detached House For Sale in Chesterfield for Offers in the region of £240,000. An early viewing is essential to appreciate the many benefits this EXECUTIVE DETACHED FAMILY HOME has to offer. Situated in the popular location of Middlecroft and standing on an impressive corner plot you will not be disappointed with the spacious accommodation this beautifully presented property has to offer. From the welcoming entrance hall is the wc and cloaks cupboard. The three reception rooms comprise a Separate Dining Room and Library/snug fitted with a range of book shelves and cupboards providing storage. Double doors lead to the charming lounge which is to the rear of the property and overlooks the back garden from the bay window with patio doors. A feature fireplace creates the focal point of the room with stone effect gas fire. The impressive kitchen/diner has an excellent range of wall and base units with integrated Fridge freezer, double electric oven, gas hob and extractor, dishwasher. The Kitchen has a lovely feature bay window. A useful utility room has plumbing for a washing machine and inset sink and drainer. Stairs lead from the hallway to the galleried landing and access to the 4 DOUBLE BEDROOMS with 3 having built in wardrobes. The master bedroom has shutters fitted to the window and a spacious en-suite shower room. Externally the property occupies a good size plot with a low maintenance garden to the rear, being mainly decked and pebbled with various patio areas. A path leads to the detached garage, currently renovated as a bar area but could easily be refurbished back to a garage. Driveway with parking for numerous vehicles. The suburb of Middlecroft/ Staveley is situated a short distance from the A619 Chesterfield, M1, Worksop Road and is convenient for Staveley shopping centre, regular bus services and high street. Staveley has recently had a newHealthy Living leisure centre built in the centre which provides a fitness room, swimming pool and spa to name but a few. Staveley also falls within great school catchments to include both Springwell and Staveley junior schools and Netherthorpe Science College Comprehensive.